U14G 05 FIRE EDP-NL Are Heading to USYS National Championships in July! New Staff Announcement - NJ Stallions Academy Hires Cesar Cascardo! Disney Boys Showcase Recap! - U17 JUVE Now Ranked #1 Nationally! 02 Bayern NPL in the Top 50! U17B BAYERN NPL & U16B MILAN EDP Are Champions @ 2018 PA Classics Winter Showcase! U14G 05 FIRE EDP-NL Are Champions @ NEWSS Showcase! Big win over Cedar Stars DA! U9G NJ Stallions 10 Wayne Utd team Finish in 1st Place @ EDP Fall Classic! U14G NJ STALLIONS 05 FIRE CROWNED 2018 NCS NJ STATE CUP CHAMPIONS! 2018 EDP CUP FALL - TOURNAMENT REVIEW - TWO U12 NJ STALLIONS BOYS TEAMS CROWNED CHAMPIONS! 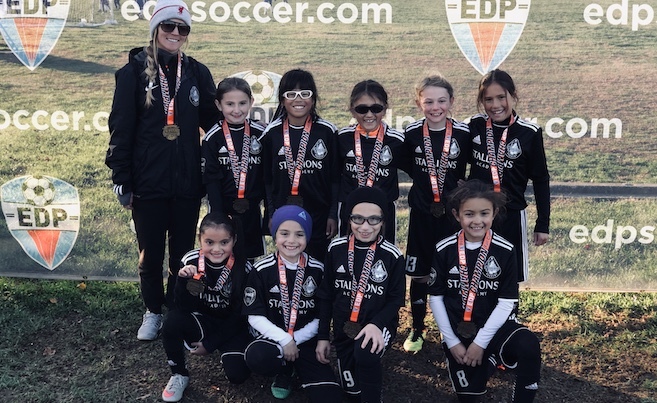 2018 CFC COLUMBUS DAY CLASSIC - 3 NJ STALLIONS GIRLS TEAMS TAKE 2ND PLACE! U17B NJ STALLIONS 02 BAYERN NPL - Crowned Champions at 2018 BARCELONA CUP! STA FALL KICKOFF RECAP - 05 North Utd Are Champions - A-GAME 2005 Are Finalists! MADISON KRAKOWER IS CALLED UP FOR U14G USWNT CAMP! U14G STING & U13G WAYNE UTD CLINCH "USYS NATIONAL LEAGUE" FOR 2018-19! FORMER NJ STALLIONS PLAYER, SAM COFFEY WITH U20 USWNT - WITH CONTINUED CALL UPS TO U20 WNT! EDP EASTER SHOWCASE RECAP! - U19B SANTOS, U16B JUVE ARE CHAMPIONS - U16B BAYERN ARE FINALISTS! NLI GIRLS SIGNING RECAP! - CLASS OF 2018 - NJ STALLIONS GIRLS PLAYING IN COLLEGE! U10G ARE CHAMPIONS @ JEFFERSON CUP! - U11G TAKE 3rd PLACE! Former NJ Stallions Player, Chris Lema is drafted by FC Dallas in 2nd Round! U16G NJ STALLIONS MAXIMUS RED CROWNED CHAMPIONS @ CASL GIRLS SHOWCASE! U10B NJ Stallions Boca EDP team are CHAMPIONS @ EDP FALL CLASSIC! U14B NJ Stallions 04 Roma EDP team are FINALISTS @ COLUMBIA FALL CLASSIC! U13G STING & U17G STAMPEDE ARE USC NATIONAL CUP REGIONAL CHAMPS - BOTH NOW HEAD TO USC NATIONAL CUP XVI FINALS! U14B NJ STALLIONS 03 INTER EDP CROWNED CHAMPIONS @ 2017 FC DELCO PLAYERS CUP! U15B NJ STALLIONS 02 JUVE - CROWNED NJ STATE CUP CHAMPIONS! - Now Ranked #1 in NJ, #7 Nationally! SEAN VEIGA & DREW SIWICKI (U15B JUVE) INVITED TO USL EXPERIENCE NATIONAL TRAINING CAMP ! JENNA VANAS HEADING TO SCOTLAND WITH REGION I ODP GIRLS TEAM! Go to 'TRYOUTS' in Top Menu for Full Details!